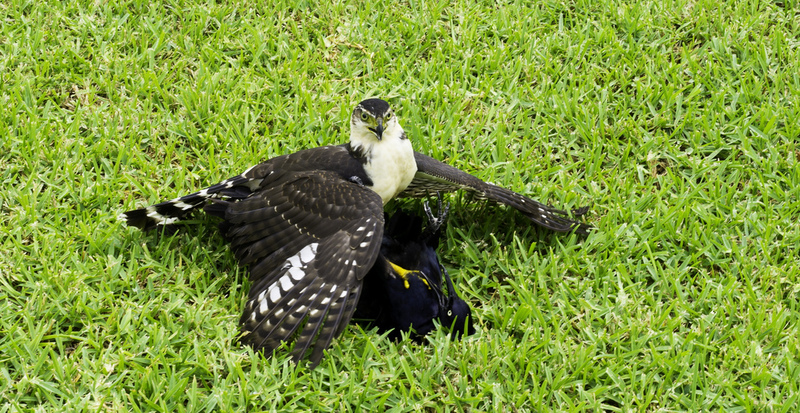 So I was lining up a shot with my wife and her friend with the Tulum ruins in the background and all of a sudden, a bird almsot smacks them in the head....I see it land in the grass behind them and i notice, wow, thats not one bird, thats two birds! And one appears to be chomping on the other one! Thats one instance where a zoom would've been nice...I had to get pretty close to them with my 35mm..luckily I didn't scare them off. Also, I wish I would've set the shutter speed faster for a bit more sharpness. But in the heat of the moment, I just basically snapped away. Fast thinking...and you got a nice shot.....amazing with 35mm really! Otis sends his regrets to the Grackle but really won't miss him......they are loud and nasty...and they eat his apple slices when they get a chance. Haha...great capture. Can you say "breakfast" .... some bully, eh? I would have missed that shot...or with just a 35mm, not even attempted it. I can appreciate those that make the extra effort, I need to get better at at that myself. Actually yes, the Hawk let him go. I think the big crowd that gathered around spooked him.